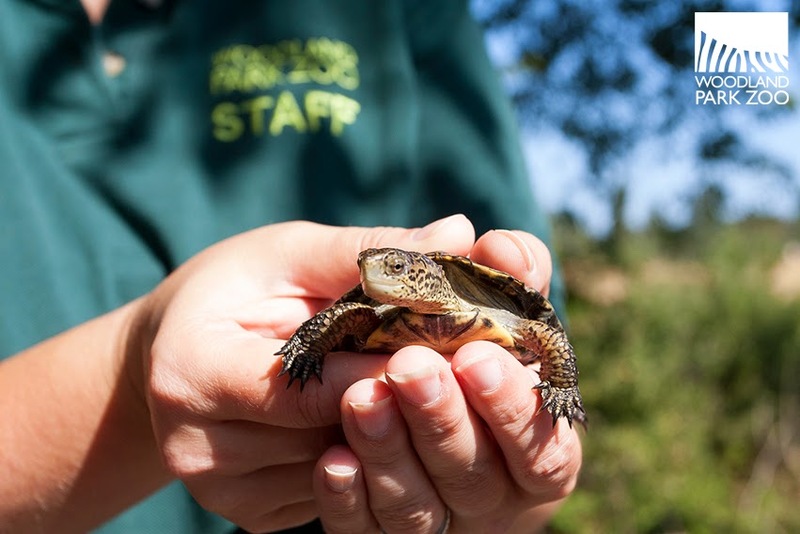 If Hollywood got its hands on the story of the endangered western pond turtle, we’d recognize all the tropes of a classic underdogturtle story, filled with struggle, redemption and hope. Woodland Park Zoo presents: The Underturtle. Because sometimes the underdog is a turtle. 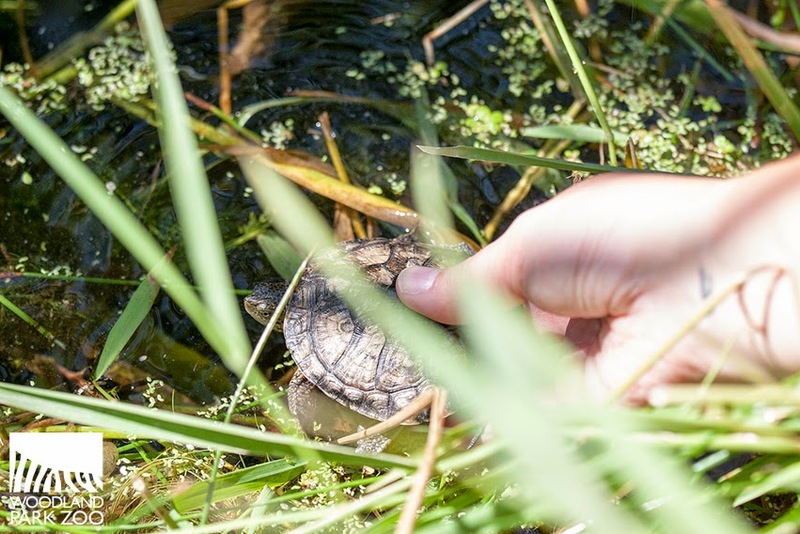 Knocked out by predators, loss of habitat and invasive species, the western pond turtle population hit a devastating low of 150 turtles in Washington in 1990. But now, this native species is poised for a comeback. For more than two decades, Woodland Park Zoo has partnered with Washington Department of Fish and Wildlife, Oregon Zoo and others to give these turtles a fighting chance. As part of our Living Northwest conservation program, we collect their eggs from the wild, hatch and raise them in the safety of the zoo until they are large enough to avoid invasive predators, and release the turtles into local waterways to rebuild their wild populations. Pond site where turtles are released. Photo by Kirsten Pisto/Woodland Park Zoo. There is hope yet. Of the 2,000 turtles that have been head started and released, at least 800 have survived, now breeding and growing their own numbers. 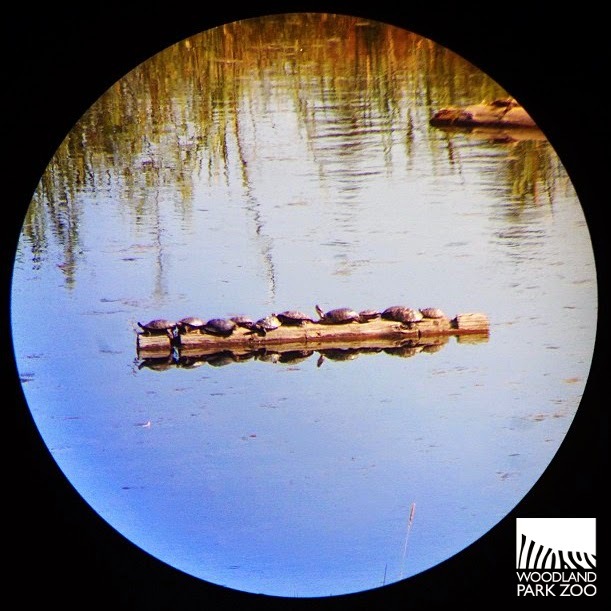 We are watching the western pond turtle’s comeback unfold before our eyes. And no individual turtle embodies that story better than our littlest fighter, turtle number 23. Hello, 23. Photo by Kirsten Pisto/Woodland Park Zoo. This is 23’s underdog tale. SCENE: July 2013. Inside the turtle rearing unit at Woodland Park Zoo, a small, heated building where young turtle hatchlings have a safe place to eat, grow and practice turtle survival skills like swimming and sunning. Here zookeepers watch over them, preparing them for release into the wild. There are over 130 turtles in the unit, and one appears to be outsized by all the others. It barely fills the palm of one’s hand. The tiny 23 back in July 2013. Photo by Kirsten Pisto/Woodland Park Zoo. 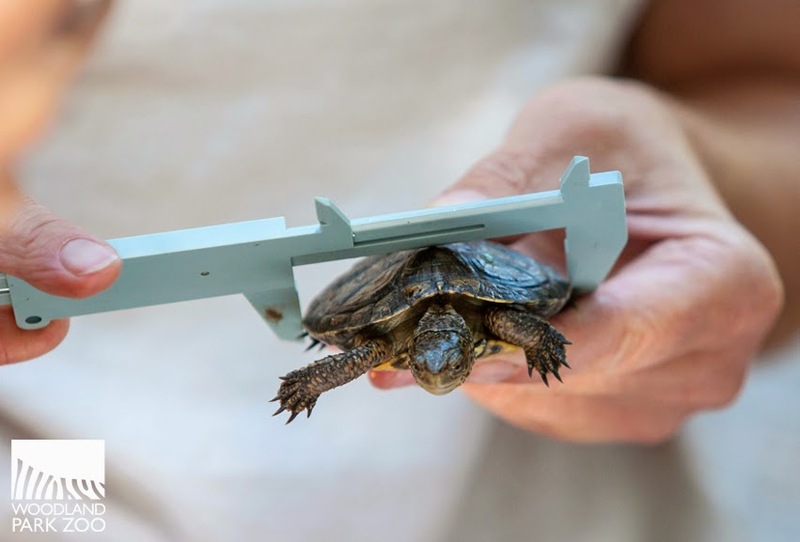 As dozens of turtles get called in to play in the big leagues—getting released into the wild—tiny number 23 is left behind, having missed the weigh-in requirements by just a few ounces. 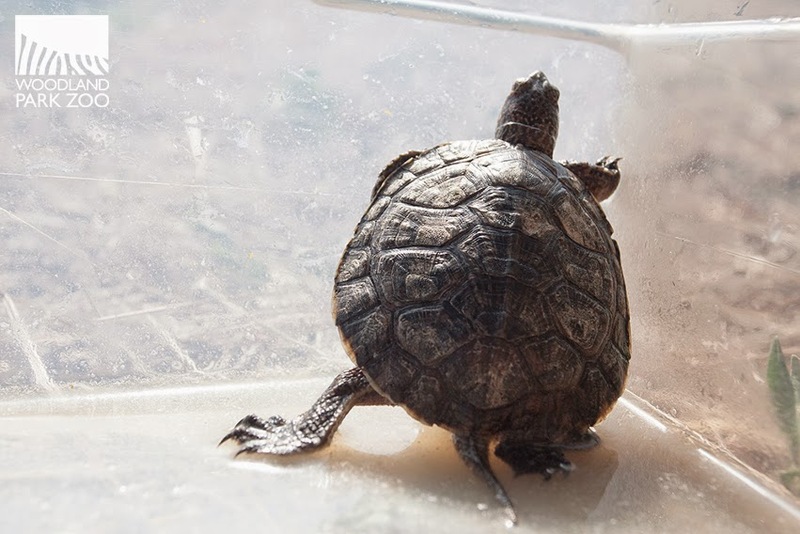 It’s hard to bench 23, but it’s for the best—the turtles need to reach a certain size before they can be released so that they are big enough to avoid the mouths of predators such as bullfrogs. It’s the best way we have to give them a fighting chance at surviving and rebuilding their population. 23’s opponent—a hungry bullfrog. 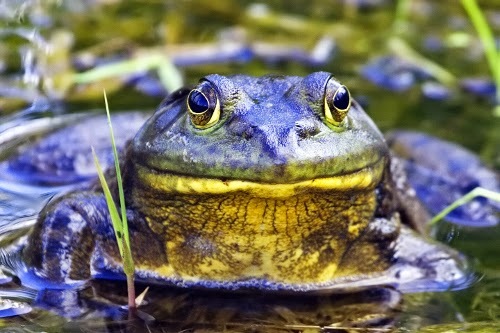 Photo: Bullfrog - natures pics/Licensed under Creative Commons. While the other turtles head off into the wild, 23 stays behind for another year. The next generation of turtle eggs arrive and hatch at the zoo, and 23 joins the new crew, preparing for its second chance. SCENE: July 2014. Outside the turtle rearing unit, a picnic table becomes a makeshift work station for Washington Department of Fish and Wildlife biologists, zoo staff and interns. 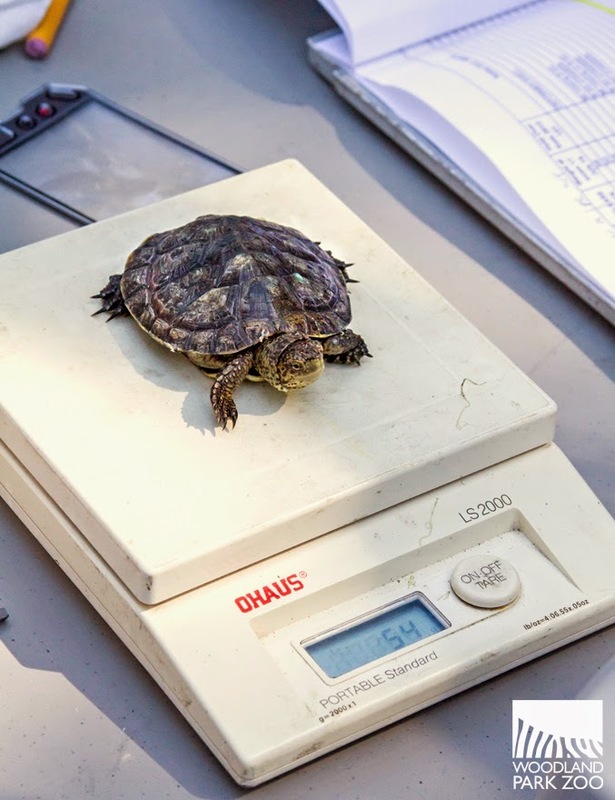 It is Turtle Prep day—time for final measurements and identification before the turtles can be released into the wild. The turtles are piled into buckets surrounding the team, and one by one are picked out to be weighed, measured, notched, assessed and approved for release. They must meet the standard of 66 mm (a little over 2.5 inches) in shell length to make the cut. 23 is up next. Put me in, coach! 23 has been training hard. It has spent the past year bulking up on a high protein diet. We’re not talking Rocky-style raw egg shakes. More like mealworms, earthworms and our own special gelatin recipe made with fish, carrots and vitamins. Compared to the other turtles, 23 still appears small, but it doesn’t need to be the biggest to be our champion—just big enough to survive on its own. The results are in: 23 measures up and makes the cut for release! The comeback is set. And now it’s time to face the final act. SCENE: August 2014. 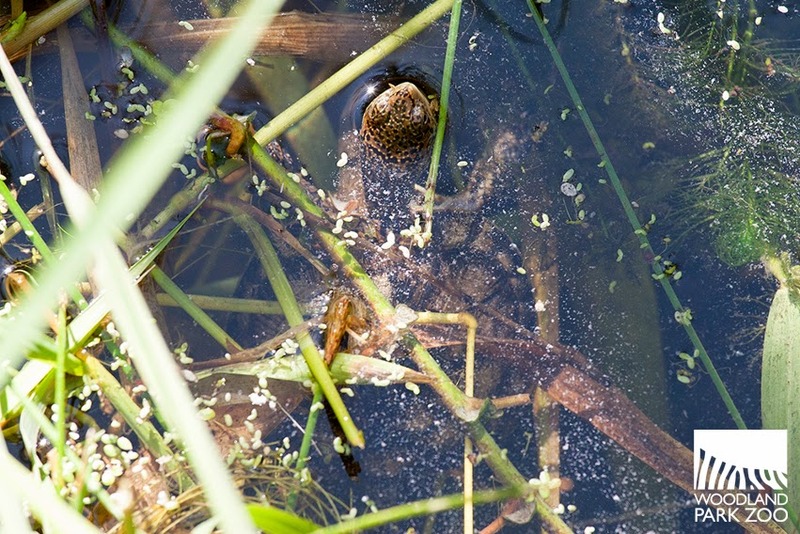 Off a suburban drag in south Puget Sound lies a well-hidden, protected pond site, home of one of Washington’s last remaining western pond turtle populations. Here Woodland Park Zoo releases its turtles each year, and we see a sign of their survival—adult turtles hanging out on a log in the pond, taking in some sun. 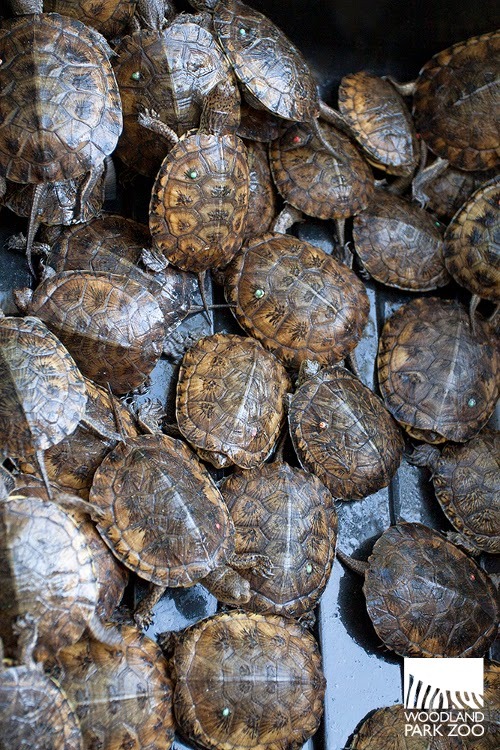 With the head started turtles piled into tubs, zoo staff and state biologists head to pond’s edge where they are set to send each one off swimming into its new home. Adult turtles soak in the sun at the pond site. Photo by Kirsten Pisto/Woodland Park Zoo. A tub of turtles await their release. Photo by John Loughlin/Woodland Park Zoo. 23 is ready to go. But before we send 23 out into the big leagues, we give the little guy some coaching. Turtle whisperer. Photo by Kirsten Pisto/Woodland Park Zoo. Swim fast. Stay vigilant. Watch for bullfrogs. Enjoy the sun. Find a mate. Go far. Keep fighting. So long and thanks for all the fish! Photo by Kirsten Pisto/Woodland Park Zoo. It’s time to say goodbye to 23, and watch it say hello to its new life. Photos by John Loughlin/Woodland Park Zoo. 23 swims away. The comeback kid has finally made it. VIDEO: Turtle 23 takes a dip. Produced by Kirsten Pisto/Woodland Park Zoo. Maybe not today, but some day, 23 is going to have to face real antagonists out there: predatory bullfrogs, emerging disease, threatened habitat. But there is reason for hope. Recent surveys indicate that the released turtles are hatching and rearing their own offspring, and the wild hatchlings are surviving. If 23 has some little ones of its own some day, we may have a sequel on our hands! Here’s how this story differs from a Hollywood tale—the audience plays a role. We’re not just here to sit back and watch—we can influence the story by taking action at home. Let’s give these turtles the happy ending for which we’re all rooting. Think twice before bringing your own Donatello or Michelangelo home. With the newest Teenage Mutant Ninja Turtles movie out, the temptation will be stronger than ever to buy pet turtles. 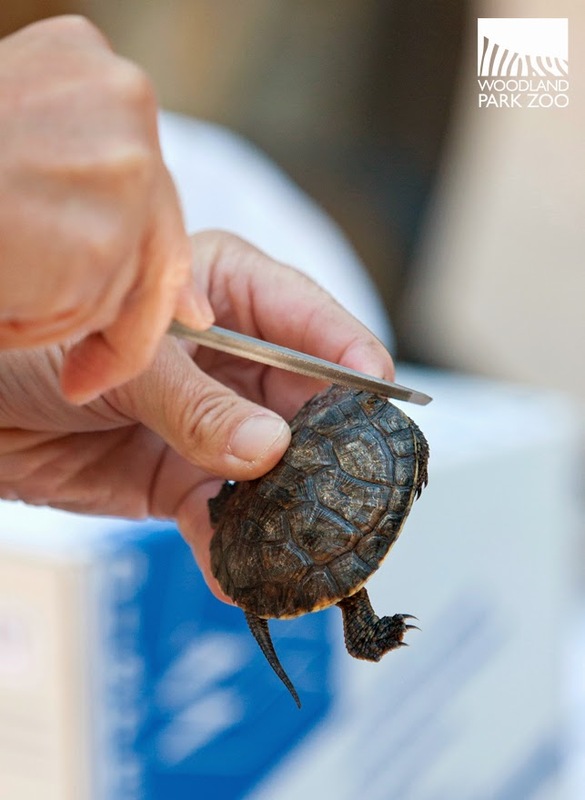 Inexperienced owners all too often end up releasing unwanted turtles into the wild, which can spread disease and lead to non-native species competing with local wildlife. Call your local animal shelter to find a new home for an unwanted pet. Keep turtles’ water clean by eliminating chemical pesticides from your gardening practices. Pesticides get into water, and once water flows away from your garden, it eventually empties into surrounding water systems—from freshwater ponds to the Puget Sound—bringing contaminants into wildlife habitat. Make a better home for native wildlife: Join a habitat restoration program in your community, or start in your own backyard by using native plants that nourish and support local wildlife rather than compete with it. Don’t miss our Backyard Habitat classes for hands-on lessons you can apply at home or in your community.